Low bun. SO easy and so effortless. Literally, I just scrunch up my hair at the nape of my neck and start pinning with bobby pins. It changes the look of your outfit and, for me, it's a welcomed change from my classic loose waves. I love pulling out a few pieces in the front to make it slightly messy and "undone". Statement earrings. You guys know I've been loving statement earrings. Especially when the hair is pulled back. I love all the bold styles and how they instantly add some drama. I've also been pairing statement earrings with a sleek and straight pony. It really draws attention to the piece in the best way possible. 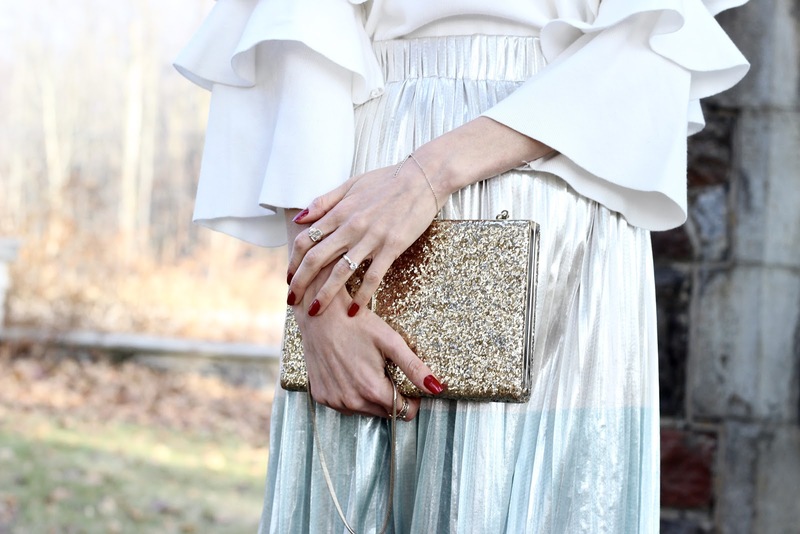 Glitter clutch. I've been pulling out this gold sequin clutch every year around the holidays. I can't believe I actually questioned purchasing it years ago for lack of versatility. I can say I definitely proved myself wrong! It's one of my most fun, most loved pieces, and it always makes an appearance during the holidays. Gold, glam, and fab! What are some ways you embrace the glam this season? A bold lip perhaps? Or a faux fur stole? Both are from last year but I love them paired together!